chipset is ralink3070 Supports 150Mbps receiving and transmitting rate. ◆ Complies with IEEE 802.11n standard, compatible with IEEE 802.11g and IEEE 802.11b standards. ◆ Provides USB2.0 port. 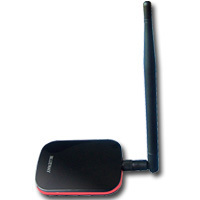 ◆ Supports 20MHz/40MHz frequency width ◆ Detects wireless network and changes transmitting rate automatically. ◆ Provides two working modes: Infrastructure and Ad-Hoc. ◆ Supports 64/128- bit WEP and WPA/WPA2 encryption methods. ◆ Supports WPS encryption for easy and fast wireless encryption to secure wireless networks. ◆ Compatible with Windows7, Vista, WindowsXP, Windows2000, MAC OS,Linux, etc. ◆ Supports WMM to smooth your audio and video.